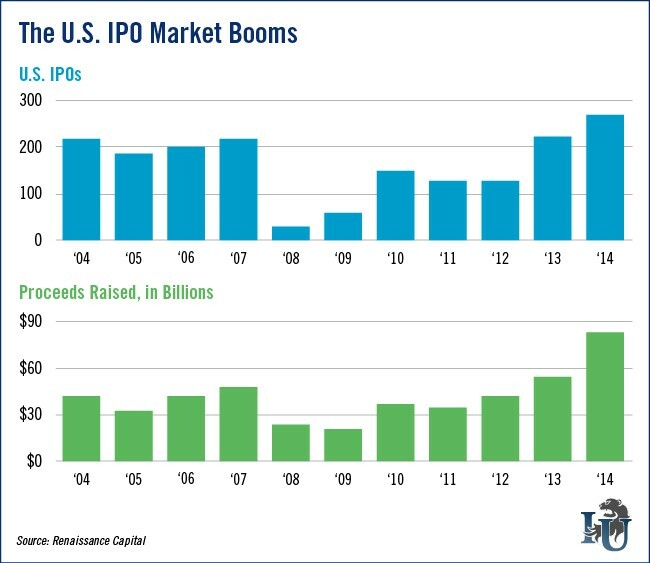 With 271 initial public offerings raking in $84.2 billion dollars to date, there’s no doubt that 2014 has been hot for IPOs. From this week’s chart we can see that the number of IPOs this year is up 23% from 2013, representing the most since the height of the dot-com bubble in 2000. We can also see that IPO proceeds jumped more than 53% - from $54.9 billion in 2013 to $84.2 billion in 2014. And with six more IPOs scheduled for next week, including Juno Therapeutics Inc. and OnDeck Capital Inc., there appears to be no end in sight for the IPO craze. So what does this mean for the 2015 IPO market? Right now, there are 588 venture and private equity-backed tech companies (including Pinterest, Square and Snapchat) queued up for the 2015 tech IPO pipeline - 40 of which will likely have values of $1 billion or more. The momentum rounding out 2014 combined with the strong tech IPO lineup in 2015 means that 2015 should be another standout year for the IPO market. Editorial Note: Alibaba may have been the 2014 headliner with its $21.8 billion IPO but there’s a breakout tech IPO that will rock the market in 2015. To find out what it is and get in on the deal pre-IPO, click here.